Doing a little traveling for business? Or maybe planning a relaxing vacation? 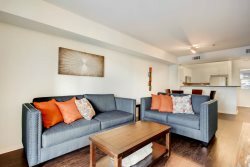 Either way this apartment offers the perfect home away from home. Step inside your rental and you’ll fall in love with the spacious floor plan, designer kitchen and home-like comfort that exceeds that of any hotel.